We were incredibly saddened to hear about the recent death of Jane Freeman. 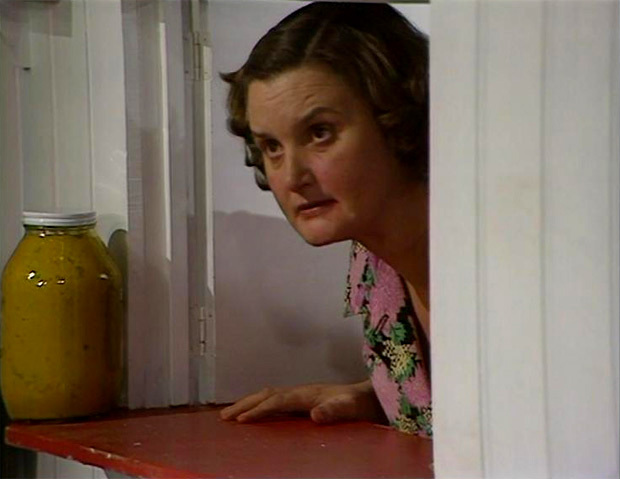 Throughout our Summer Winos quest, we have been constantly impressed by Jane’s deft and formidable portrayal of the redoubtable cafe owner Ivy, and the skilful manner in which she gave the character both a fearsome temper and a frequently-overlooked humanity and sensitivity. She proved a fearsome foil for the show’s ever-evolving main trio, as well as forging hugely impressive enjoyable double acts with both John Comer, as Ivy’s on-screen husband Sid, and Jonathan Linsley, as her wayward nephew Crusher. Last of the Summer Wine entered Jane’s life with the series’ pilot episode, Of Funerals and Fish, in 1973. Both Freeman and Comer were cast after impressing producer-director James Gilbert in The Fishing Party, an instalment of the BBC’s Play For Today strand of one-off dramas. The pair had never met on this production, their scenes having been shot separately, and they worked together on Last of the Summer Wine for some time before realising they had both appeared in the same, earlier programme. However, in numerous episodes, the veil of aggression is peeled back to reveal the woman underneath. 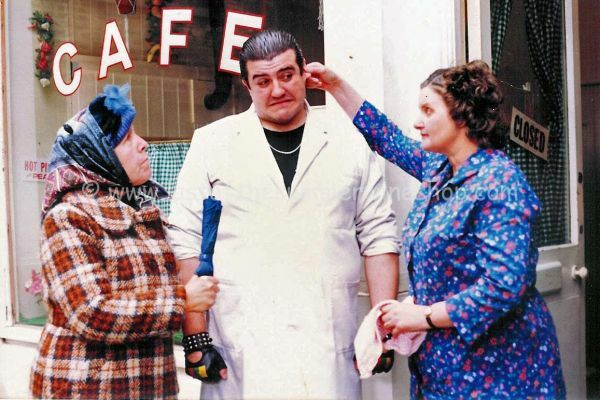 Take, for example, a sequence from the Series One episode, Patê and Chips. Compo’s extended family have turned up to shepherd our main trio on an outing to a National Trust home, and Ivy immediately makes a beeline for the youngest of the clan, a baby boy. IVY: We’ve got none you know. All I can do is mother him. The baby’s father cracks a joke about donating one of their own offspring to the childless couple, but – as Ivy is wistfully waving goodbye – a very poignant musical cue suggests a deeper resonance to the absence of children from Ivy and Sid’s marriage. It’s a beautiful little moment, combining fine writing, acting and composing. Another glimpse of humanity can be seen in an exhange between Ivy and Nora Batty in the 1988 Christmas special, Crumbs. NORA: Funny, isn’t it? All this time, and still sometimes when I head that door open I keep expecting him to walk in like he always used to, daft as a brush, semi-plastered. IVY: Oh, I know. It’s having all that bed to yourself that gets me. NORA: I’ll say this for my Wally, he never did take up much room. It was like having a bed to yourself anyway. IVY: Oh, mine used to spread himself all over the place. Every night it used to be like being trapped in the January sales. You never realise how much you’re going to miss things. These typically unsentimental/sentimental scenes shed new light on relationships that we may originally have taken at surface value. Last of the Summer Wine didn’t connect with viewers for over three decades because of pratfalls and pretty location shooting; it rooted itself in the public consciousness thanks to important moments like this, and they’re easy to take for granted. This is the series at its best, and Freeman was a intergral part of its success. Freeman and Kathy Staff maintained a close friendship for several decades, though it was a tentative friendship at first; during the early years of the series most of Staff’s scenes were shot on location, whilst Freeman recorded her Café sequences in the studio at a later date. As time passed, though, they bonded during rehearsals, taking in tea at the Ritz and shopping in London. During their Yorkshire location shoots, Jane would stay at the home of Kathy and her husband in Cheshire, a twenty minute drive across the Pennines. In later years, Freeman was the only member of the cast to know the true severity of Staff’s final battle with a brain tumour. Ivy was second only to Peter Sallis’ Norman Clegg as Last of the Summer Wine‘s longest-running character, appearing in all but four of the series’ episodes. During its run, she outlived her husband Sid; mentored nephew Crusher; and was welcomed intoto the inner circle of Thora Hird’s formidable Edie. Her unexplained absence from the series’ finale was one of the only downsides of a fittingly low-key conclusion. In every incarnation of the show, she was an anchor around whom chaos unfolded. Freeman, too, saw the series evolve across the decades from a darkly humerous comedy into a cosier, more family-friendly staple; and from a traditional studio-based sitcom recorded before live audience into a series that was shot predominantly on location and entirely on film. She even found time to appear in the sieres’ mid-1980s spin-off stage show. Of all her appearences, however, she singled out the 1983 feature length special, Getting Sam Home, as her personal favourite. Jane was born in London. At the age of nine, she lost her father in an accident and, sometime later, moved with her mother and stepfather to Merthyr Tydfil, South Wales. Here, she studied at the City of Cardiff (now Royal Welsh) College of Music and Drama, graduating in 1955. Throwing herself into a busy stage career, Jane joined the Gloucestershire-based all-female Osiris Repertory Theatre touring company, and – in 1958 – moved onto the Arena Theatre, Sutton Coldfield where she began to attract attention for her performances. During her 1968 to 1973 stint with Birmingham Rep, she married the company’s artistic director, Michael Simpson. They remained together until his death in 2007. Although she maintained her passion for live performance throughout her career, Jane enjoyed a busy career in television and, to a lesser extent, film. After her TV debut in a Ken Loach directed episode of Diary of a Young Marriage (1964), notable roles included four appearances in the BBC’s Play For Today strand of single plays, including Peter Terson aforementioned The Fishing Party (1972) and Alan Bleasdale’s Scully’s New Year’s Eve (1978). Other notable roles included appearances in Crossroads (1964), Within These Walls (1975 & 1976), The Black Adder (1983), Androcles the Lion (1983), and Silas Marner (1985). Despite these varied roles, her best-recognised role outside of Last of the Summer Wine may have been as Gordon Rollings’ wife, in a series of early 1980s advertisements for John Smith’s Yorkshire Bitter. After Rollings’ death, Jane continued to appear in ads with her Summer Wine co-star Jonathan Linsley. Last of the Summer Wine provided Jane with regular employment, but she scheduled as much theatre work around its filming dates as possible. A fraction of her work in the theatre included Billy Liar (Nottingham Playhouse 1980), Sailor Beware! (The Lyric, Hammersmith, 1991), Deborah’s Daughter (Library Theatre, Manchester, 1994), Wuthering Heights (1995 & 1998) and touring productions of When We Are Married (1987), Noises Off (1987), and Situation Comedy (1989). When we at Summer Winos learned of Jane Freeman’s passing, we reached out to several friends, colleagues and acquaintences, all of whom were kind enough to share their personal memories. “I first met Jane in the spring of 1983 when we started rehearsals for a stage play of Last of the Summer Wine. We didn’t have many scenes together and at that time my character, Crusher, was not related to Jane’s character, Ivy. We became friends, however, and I always enjoyed her wisdom, advice, and her stories of growing up and “learning the business” of acting through Rep in Birmingham, where she was great friends with Paul Henry who famously played Benny in Crossroads – she admired the skill he brought to a role that required him to play someone none too bright! After two short tours and two summer seasons of the Summer Wine stage play, fate played a hand in bringing Jane and I together when John Comer, her long time co-star and husband in the TV show, passed away and Roy Clarke and Alan JW Bell invited me to play Ivy’s nephew Millburn; a none too bright lad who was “learning the business”. Jane was wonderful and helpful and I loved working with her. Her timing and skill made her a true joy to work with. She was also never starry or grand and over the next five years we struck up a professional relationship that had a certain chemistry, and I became part of the Summer Wine family. When I left the show, fate played another hand and threw Jane and me together a second time. The untimely death of Gordon Rollings who played her long time screen husband Arkwright in the much loved John Smiths TV adverts, meant that they were looking for an actor to replace him. Mrs Arkwright wanted a “toy boy” and I was given that role and we worked together for another couple of years. I remember the last filming day at pinewood with Jane when she had another job later on that day and the production company flew her by helicopter so she could get to the other set on time. She was so excited about that experience and we all stood and waved her off . I never saw her again after that as we never worked together after that day, but she was always busy working, and I kept in touch and later caught up with all her news when I worked for her husband Michael Simpson who was the producer on The Bill. “It is easy to fall in to the trap – even for those of us who should know better, having been around the industry for a while – of thinking that the character you see on screen is also that person in real life. And so it was in the late 1990s, when I was visiting the location of Last of the Summer Wine for the first time for a book about the show for the BBC, that I got to meet a host of actors who, in most cases (although not all) were totally different from the characters they portrayed on screen. One such actress was Jane Freeman, who has sadly passed away in recent weeks. It’s easy to watch someone week in and week out playing a battleaxe, a demanding wife – who is really more of a mother to her husband than a spouse, because the men need keeping in check like children in a playground – believing that the person you will meet will be equally as formidable. But that was the strength of the acting in Summer Wine, for Jane Freeman was nothing like the harridan Ivy, the character she played for almost four decades. I recall sitting in a humble caravan, waiting for the weather to settle before filming could resume, one morning in the Yorkshire hills. I was having a cup of tea with Jane Freeman, Kathy Staff and my late, dear friend Thora Hird. It was slightly surreal as I was chatting with the actresses but they were all dressed up and made up as their characters. They couldn’t have been more lovely. Tea with some favourite aunts. What I loved the most about Jane and Kathy was how they would fuss over Thora who was somewhat older and quite infirm by this stage. I admired Jane’s humility. She was an ensemble player and did not regard herself any more important than anyone else, despite appearing in more episodes of the show than anyone else except Peter Sallis. Jane was kind, friendly and polite and was surprised that someone would be interested enough in her as a person and not just as a character, to write about her in a book on Summer Wine. We met several times after that. I recall a cameo role with her when Edie was driving a car towards me. 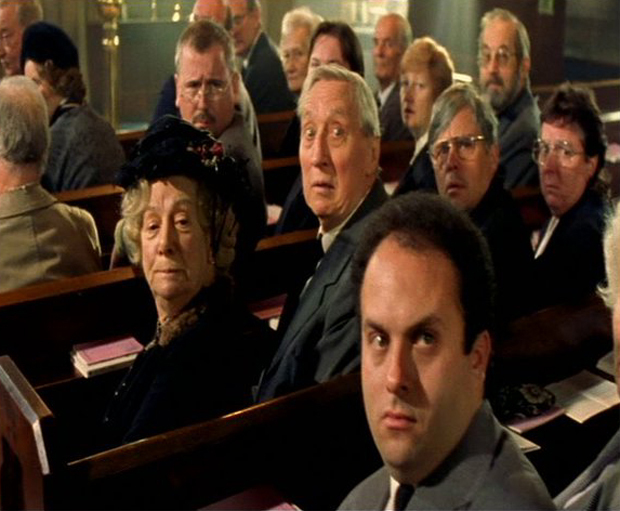 And of course who could ever forget Compo’s funeral where we all spent a long day in church filming scenes for the show, and then the same evening together at a memorial for the actor Bill Owen. And I was delighted to welcome Jane, along with most of the cast, to a special tribute to Summer Wine at Pinewood Studios that I organised, back in 1998. We end this tribute with a trip to the real life Sid’s Café in Holmfirth. 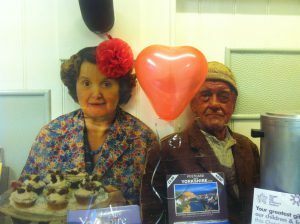 Visit today, and you’ll discover that – and alongside Nora and Compo – you will be greeted by a cardboard effigy of the formidable Ivy. Jane Freeman’s career was long, varied, and thanks to her suberb, decades-long performance in Last of the Summer Wine, will be remembered fondly for many years to come.